If you're not too shy, feel free to ask any knitting- or class-related questions here. If it's class-related, either Tarma or I will answer; if it's knitting-related, Tarma or I will answer, or maybe one of your classmates can answer, that's fine. Your professors aren't the only knitters here, you know. Oh, I'll start off with mentioning a way to make sure you don't miss any of the exciting things bound to happen here; it's a trick I learned from Tarma. As there are so many class forums here, keeping up with only the forums for your classes can be difficult. However, you can subscribe to a forum or a topic by choosing the appropriate entry in the Options menu in the forum or thread you'd like to follow. The great thing is that you can choose to get emails whenever there's a new post or thread. It's dead useful for the different class forums, though some people *cough* use it practically everywhere. Soooo something has gone strangely wrong, and I don't know what happened. Basically, I don't remember how I maybe dropped a stitch or something, but the knitting managed to like....reverse? So there's a portion where I am at where some parts clearly have three rows and others four. No biggie, right? Alas, it's a little biggie. You see, the direction of the actual knitting is towards the larger stuff, as in my working yarn is away from the smaller stuff, and I don't know how to put it back. I may be the world's most incompetent person. I considered startting over, but I'm stubborn and wanted to see if this could get fixed first. Thanks! That said, when I first read of your puzzle, Katie, I think what you might have done is create a sort of 'short row'. It reminded me of me starting to knit on a row, where I had knit halfway through the row and put the piece down to go get some coffee or put in a movie or something. Then I went back, and, forgetting which direction I was knitting, I went the other way. Does that seem possible, that you put it down to do something and then started knitting again, but in the other direction? Cosmo will return with more clear, and cohesive, possible explanation(s) -- I'm STILL a neophyte knitter and make all sorts of inadvertent interesting stuff in my knitting. Ah. You want to FIX it. Oh, Dario, that is BRILLIANT! Professor Mott (aka The Cheeky One) has an expression - Frog it. You .... rip it out. You go back to before the error started; undo all your stitches to there. And start over again. Thing is, you need to catch all the stuff you already knit before that, so the whole thing doesn't unravel! Also, I'm going to call the presence of this topic to Professor Mott who had a very exciting past few days and thus might have missed this being here. SHE will know what happened. Katie Sanders wrote: QUOTE (Katie Sanders @ Mar 30 2013, 11:50 AM) Basically, I don't remember how I maybe dropped a stitch or something, but the knitting managed to like....reverse? So there's a portion where I am at where some parts clearly have three rows and others four. No biggie, right? Alas, it's a little biggie. You see, the direction of the actual knitting is towards the larger stuff, as in my working yarn is away from the smaller stuff, and I don't know how to put it back. Sorry for the bit of a delay. I was indeed, as Tarma mentioned, having an exciting few days, and then I wanted to have a bit of a think on this before replying. First, you are not the world's most incompetent person; every knitter does something weird and, to them, unexplainable with their knitting. It's part of the fun... or something. I think Tarma hit the nail on the proverbial head in her "diagnosis," that you made an accidental short row. You could do something like Dario suggests, if you can figure out where you have the extra stitches, but that will probably make your washcloth buckle a bit (meaning it won't be flat). If you're okay with the imperfection, whether you use Dario's suggestion or just keep knitting the pattern and have that one spot that's a bit unlike the rest, that's perfectly fine. Nothing for the class needs to be knitted perfectly. If you want to fix it, depending on how far you've gotten since then, you can; it just involves ripping stitches out in some fashion or other. The most obvious choice is to undo the whole thing and start from scratch, though it's perfectly understandable if you'd rather not. If you're several rows past the spot, it may be easiest to take the needle out and unravel the knitting to that spot. Actually, when I have to do this, I like to do it to the row above the problem area and then tink back the rest of the way; this way I know I've got everything properly lined up to knit again. Psh, Dario, you're welcome here whenever you'd like. Am I correct in thinking that your method of dealing with your skipped stitches resulted in a bit of a bump or buckle in your knitting? If it was only a row, it's probably not a big bump, but based on my understanding of knitting physics, I can't imagine you could do what you say you did and not get a bit of a bump. Prof. Tarma Amelia Black wrote: QUOTE (Prof. Tarma Amelia Black @ Apr 1 2013, 12:15 PM) Professor Mott (aka The Cheeky One) has an expression - Frog it. It's not like I made it up, you know. Yes, sometimes knitting terms are a bit cheesy (or, if you'd prefer, corny *cg*), but they're sort of fun, right? Though, to be fair, I'm not sure whether it's strictly a knitting term or more knitting jargon. Cosmo, why didn't you tell of us this? Picture shows a woman and girl looking at a piece of knitting. 'Clouds' and 'creatures' are coming out from the neckline of the knit sweater. Words under the picture "Okay, I see what happened. Common newbie mistake. 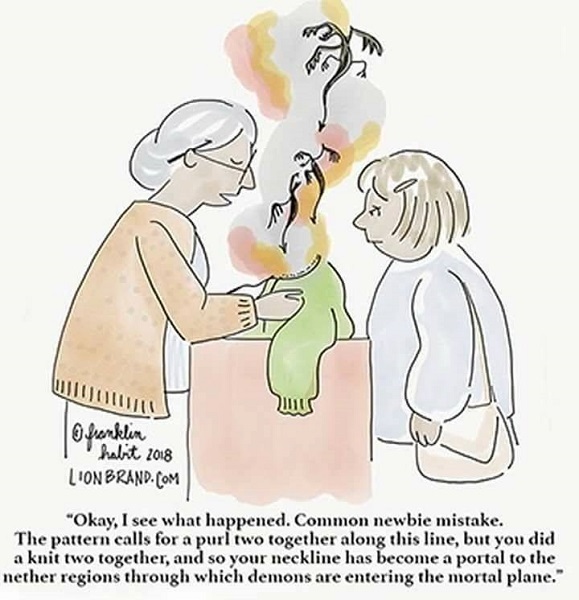 The pattern calls for a purl two together along this line, but you did a knit two together, and so your neckline has become a portal to the nether regions through which demons are entering the mortal plane."